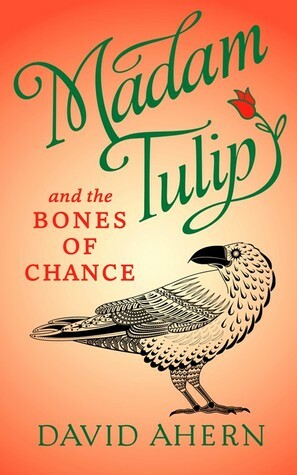 Back again with another fun Madam Tulip adventure! After reviewing the previous two books by David Ahern, he graciously gifted me an ARC of the newest installment of Madam Tulip. Derry O'Donnell gets an offer she just can't refuse (which granted, isn't saying much when you're an unemployed actor). A part in a film being shot in Scotland, playing a (you guessed it) fortune teller. No audition necessary, cushy pay, and all expenses paid. Her BFF and fellow actor, Bruce is also given a part, same conditions, to sweeten the deal. Packing her bags, Derry sets off for the Scottish highlands where it doesn't take long for mystery to unfold. Production has been riddled with mishaps and something just doesn't sit right with Derry about the whole thing. She gets roped into doing a private reading with the producer and his family, further entangling herself in what inevitably proves to be a mortally dangerous game of who, what, why. Much like its predecessors, The Bones of Chance is filled with that impossible Derry circumstance. This chick seems doomed to fall into one bad situation after another. But like always, her wit and (mostly) good sense pull through in the end. Having an ex-military BFF helping out doesn't hurt the girls survival rates either if we're being honest, but she certainly holds her own in life and death situations. Bones of Chance was a fun read, light and humorous while simultaneously having that underlying nervous tension thrumming as any good mystery should. I enjoy the sub plots with Jacko and Vanessa, they always bring a pleasantly comical element to the story line and this time was no exception. This is definitely a fun series for all my mystery fans out there, and I certainly plan on following Derry into her next misadventure! Bones of Chance will be released 4/12/18 and is avaible for pre-order on Amazon! Until next week my bookish friends!